RUN your fingers over the white keys of a piano. The notes get higher and higher as your hand moves to the right. On the eighth key, something beautiful happens: a note hangs in the air that embodies something of the first, only with a different pitch. We began to twig that something similar was going on with the chemical elements more than 150 years ago. Scientists even called it the law of octaves. And it is this repetition in the properties of the elements that the periodic table captures so beautifully. Similar elements end up stacked in columns or groups. One group comprises noble gases like argon and neon that barely react with anything, another contains reactive metals, some of which, like francium, explode on contact with water. 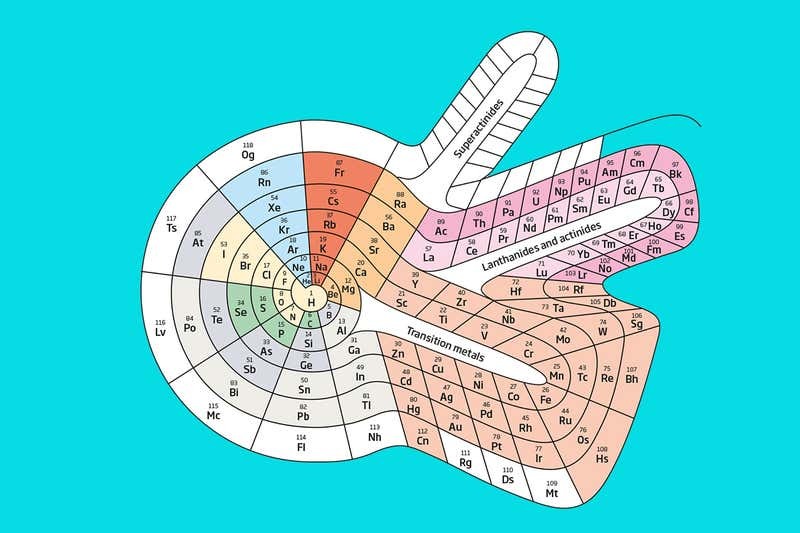 But there are doubts over whether the periodic table is in the best possible configuration. Just as notes can be arranged in various ways to produce music, so the essence of the relationships between the elements could be depicted differently. There is no easy way to judge which is better, or more “true”. So arguments over perceived flaws in the current arrangement rumble on, with some chemists arguing that certain elements should be relocated – and others working on more radical ways to recompose the table. At first, the elements were organised by atomic weight. Now we order them by the number of protons in their nucleus. We also know that their properties are largely determined by the arrangement of the negatively charged electrons that orbit in successive shells around the nucleus. The lightest elements have just one shell, which can hold two of these particles. Heavier elements have more shells that can hold larger numbers of electrons. What really matters for each element’s behaviour, however, is how many electrons it has in its outer shell. That number tends to fit nicely with the way the table is arranged, namely to place elements with similar properties in the same group. For instance, group 1 elements have one electron in their outer shell and those in group 2 have two. But it doesn’t always fit together quite as neatly as all that. Take the first element. Hydrogen has one electron in its outermost shell so you might assume it belongs exactly where it is, in group 1 above lithium and sodium, which also have one electron in their outermost shell. Yet hydrogen is a gas, not a metal, so its properties don’t fit. The complication arises because, with an outer shell that can only hold two electrons, hydrogen is one electron away from being full. Given that elements yearn for full outer shells, that makes it very reactive. In this sense, hydrogen resembles the elements in group 17, namely the halogens like chlorine. Their outer shells need only gain one electron to achieve a full shell of eight, which makes them similarly reactive. In terms of its properties, then, hydrogen is closer to chlorine than lithium. Read more: Elements quiz: How well do you know the periodic table? Why are mercury and gold so weird? Lower down the table there are no available spaces for misplaced elements. Even so, a couple of the incumbents look like outliers. Take mercury, also known as quicksilver because it is a liquid at room temperature. In that sense, it is quite different to the other members of group 12, including zinc and cadmium, which are all solid metals. What gives? The further down the table you go, the more of the positively charged protons an element’s nucleus contains. This creates a stronger pull on the orbiting electrons, meaning they must travel faster and faster. By the time you reach mercury, the electrons are travelling at 58 per cent of the speed of light. According to Einstein’s special theory of relativity, this means their effective mass is significantly higher than an electron’s normal mass, which exacerbates the inward pull they feel. The upshot is that mercury’s electrons orbit so tightly that they can’t be shared to form bonds with other atoms, as is required to make a solid. The same thing explains why gold is gold, a unique colour among metals: relativistic effects change the way electrons absorb light. Group 3 holds two elements that might belong elsewhere. As we move across the upper rows of the table, electrons fill up shells in a sequence of so-called orbitals, waiting until the innermost shell is full before entering the next. By element 57, lanthanum, the electrons begin to enter a new type of orbital, an f-orbital. To account for this, most periodic tables hive off the elements making up this f-block, putting it below the table, leaving a gap in group 3. Fair enough. But there is debate over which of the elements in the f-block should come first. Some chemists maintain that the decision should come down to electron configuration, which would leave the table as it is, with lanthanum and actinium at the left-hand end of the f-block. Others point out that chemical properties such as atomic radius and melting point make lutetium and lawrencium, currently at the right end, a better bet. In 2016, the International Union of Pure and Applied Chemistry assembled a task group to settle the argument. But no one expects a decision soon. 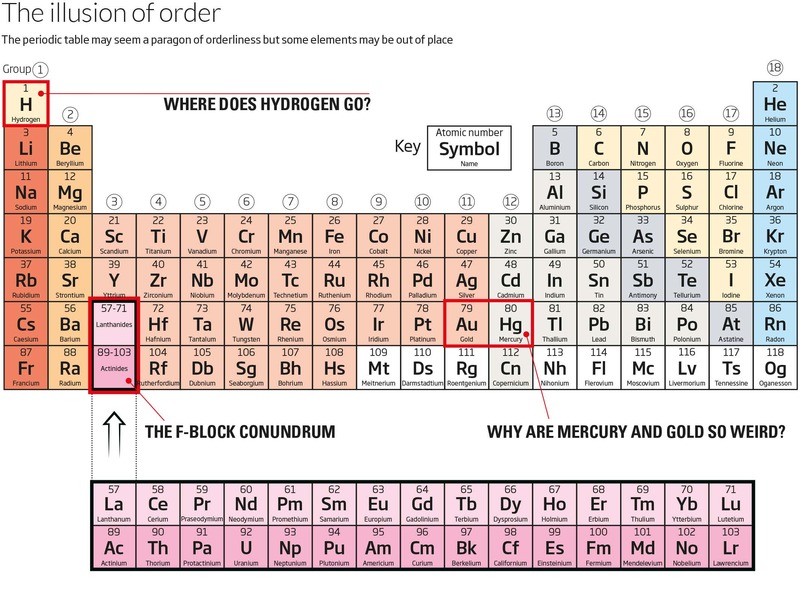 All these niggles have persuaded some chemists that we need to redraw the periodic table – and there is no shortage of ideas. Mark Leach at Manchester Metropolitan University, UK, keeps the internet database of periodic tables, which contains hundreds of versions. In an attempt to better represent the continuity where one row currently ends, retired Canadian chemist Fernando Dufour developed a 3D periodic system that looks like a Christmas tree, with the elements radiating from a trunk in circles that get larger closer to the bottom. An alternative is the spiral developed by Theodor Benfey, which allows the f-block to bulge outwards (see main image, above). Eric Scerri at the University of California, Los Angeles, is among those who has argued for more fundamental changes. He previously proposed that the table could be arranged to maximise the number of “triads”, sets of three elements that share similar properties and are related by their atomic weights. These days, he is backing an even more drastic approach: make the table not 18 but 32 columns by slotting all 30 f-block elements between the current groups 2 and 3 (see “Going long”). This allows the atomic number to run in an uninterrupted sequence. But Guillermo Restrepo at the Max Planck Institute for Mathematics in the Sciences, Germany, favours an alternative. He has explored whether chemical similarity of elements in the same columns still holds as well as it did 150 years ago, given our increased knowledge of chemical reactivity. His conclusion is that lanthanum belongs in group 3 – that is, out of sequence.